Wallo will showcase its Stand UP Collection at the Montreal Fashion and Design Festival in the Cabinet Éphémère’s collective fashion show, next Wednesday, August 17th at 7:30 pm at the Passerelle du Casino – Quartier des Spectacles. Proudly Canadian, Wallo is a new fashion label by designer and visual artist Marie-Andrée Wallot. Wallo’s Stand Up collection, predominantly crafted from stretch silk charmeuse, was launched at OGILVY’s Cabinet Éphémère last June. Wearable Art on Silk Inspired by the women who will wear them, MarieAndrée Wallot creates unique pieces by drawing, hand painting and digitally refining patterns to be printed on stretch silk charmeuse of the highest quality. Her chic and sleek designs and colourful prints exude intelligence, happiness and empowerment. Expertly crafted, high-end fashion Wallo’s designs, thanks to modern and balanced cuts, are the perfect canvas for Marie-Andrée Wallot’s pictorial works of art. The collection includes beautiful silk scarves, flowy tops, edgy pants and leggings, airy and elegant dresses, easy tunics and a bohoinspired, breezy maxi dress. Making silk clothing requires a particular expertise, from design to sewing. Beauty, comfort and the elegance of high-end craftsmanship – that is what Wallo strives to offer. Silk – A choice for elegance Wallo’s silk is made from 90% charmeuse silk and 10% Lycra, the result being a material that is tremendously soft, resistant and comfortable. Marie-Andrée Wallot explains: “The charmeuse silk that we use offers an amazing depth of color. Because it is timeless, to me, silk symbolises the rich and everlasting nature of human relationships. It is soft, light, fresh and silky on the skin – it is a joy to wear. It fluidly follows the body’s movements and drapes joyfully and gracefully.” A world of vibrant colors Through Wallo’s paintings, we discover the faces of strong and kind women, rich textures and endless shades of petal pink, fuchsia and purple dancing with azure blue, clay white and neutral tones. Color takes central stage on the lively, eclectic designs inspired by their creator, a woman who has spent her whole life in pursuit of art and beauty in all its forms. Marie-Andrée Wallot is a visual artist whose work has been exhibited. She also produced several visual installations on stage, and she went on to produce multimedia shows as well as the awarded art video L’Appât. Wallo specializes in the design, production and sale, online and in-store, of contemporary fashion for women. Inspired by the pictorial and digital art of designer Marie-Andrée Wallot, Wallo develops and produces high-end clothing for the sophisticated woman who seeks high quality, exclusive and daring pieces. For more information, visit wallo.ca Cabinet Éphémère is an initiative of Fashion Designers’ Council of Quebec Fashion Designers’ Council of Quebec is a professional association founded in 2011. Its mission is to represent fashion creators and defend their rights and interests as one. 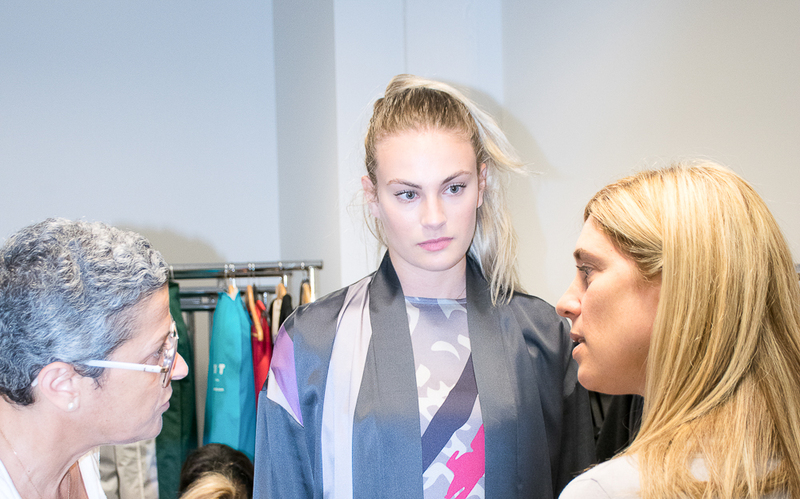 Bringing established and emergent labels together, the CCMQ is dedicated to the promotion of Quebec’s fashion design on the local and the international stage. To learn more, please refer to their Facebook page www.facebook.com/mode.ccmq. The Fashion & Design Festival The Fashion & Design Festival celebrates creativity and culture through a major outdoor event in the heart of downtown Montreal.